August 22nd – Over 100 people hold an angry rally and proceed to march down Franklin St. In solidarity with the riots and protests in Ferguson. In response to a column in the Daily Tar Heel condemning the anger and tone of the protest, a piece is released online and in paper several days later that defends the protest. 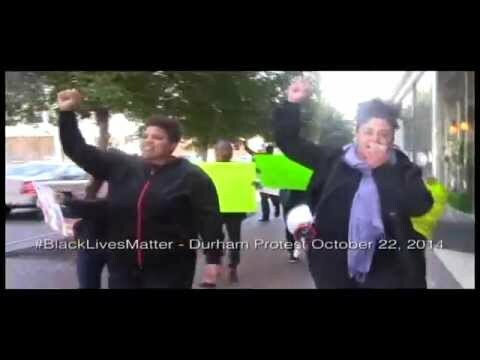 October 22nd – As part of a traditional, national day of action against police brutality, a small march and protest takes place at the downtown Durham jail. November 18th – Spirithouse organizes a “court mob” as part of ongoing solidarity with Carlos Riley, Jr., a Black man accused of shooting a cop in the foot during an altercation with police. November 24th, 9pm – The prosecutor in charge of the Grand Jury in Ferguson, MO announces that there will be no charges filed against Darren Wilson. Within an hour both St. Louis and Ferguson are rioting. Hundreds surround the police station, cruisers are attacked, small riots spread throughout both cities, groups of fifty or a hundred fire shots at police, and over 20 buildings are set on fire. The country as a whole explodes over the next 48 hours, with hundreds of cities and towns staging protests, many of which succeed in blocking major bridges or highways. 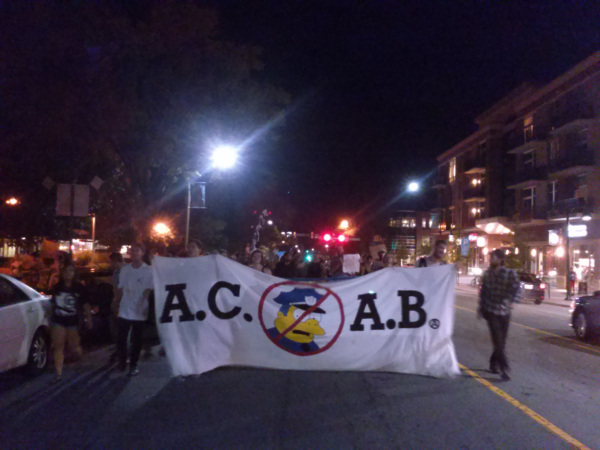 November 24th – Over 100 people gather to express sorrow at the decision and rage towards the police at Peace and Justice Plaza in Chapel Hill. Nov 25th – After a week and a half of promotion, with a twitter handle set up (@NC4Ferguson) to spread the word and handbills and posters distributed in neighborhoods all over the city, a diverse group of over 200 people convenes at the Durham library. After 30 minutes of impromptu speeches and discussion, the crowd marches into downtown, setting off fireworks and pulling objects into roadways. A yuppie restaurant is spray-painted along with the downtown jail. The crowd eventually makes its way onto NC 147 with chants of “One, Four, Seven,” and blocks the northbound lanes for a half an hour before marching back into downtown and screaming “We Remember” at riot police stationed outside DPD Headquarters.